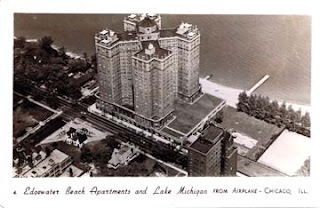 Before the city extended Lake Shore Drive, the Edgewater Beach Apartments, part of the Edgewater Beach Hotel complex, sat right on the shore. 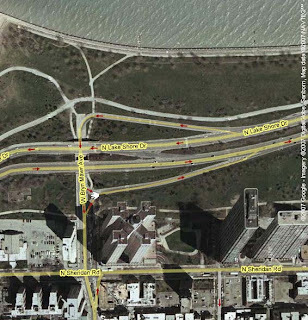 Below is an image captured from Google Maps, showing just how far the Apartments now are from the lake front. Click on image for a larger view. What I find even more interesting is the areas surrounding the Edgewater Beach Coop, all those homes (or smaller apt bldgs) are now gone & replaced by modern 4+1's & high-rise buildings.